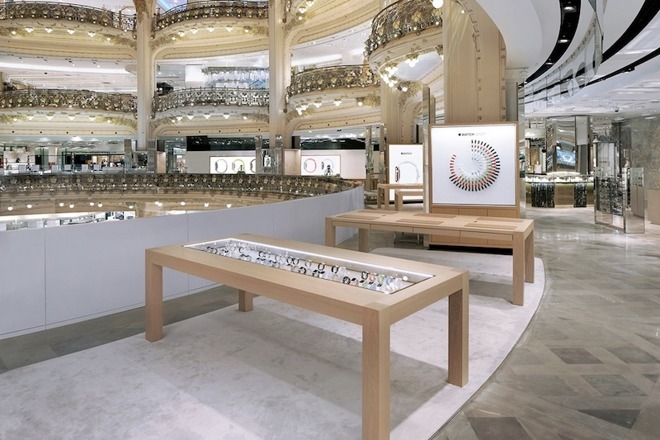 Apple has shut down a second dedicated Apple Watch gallery, with the closure of the boutique store in the Galeries Lafayette shopping center in Paris taking place weeks after a similar Apple Watch pop-up shop in London closed. The listings of Apple Stores in France no longer includes the Galeries Lafayette, an indication of the temporary retail location's closure. Additionally, AppleInsider has been informed that the area where the watch boutique resided is mostly cleared out, with only the Apple Watch standing sign remaining as of Jan. 20. Apple opened up three pop-up stores dedicated to the Apple Watch in mid-2015, located in Selfridges in London, Isetan Shinjuku in Tokyo, and Galeries Lafayette, Paris. The stores were used solely for the sale of Apple Watches, and were among the venues used to sell the premium gold Apple Watch Edition. During the launch of the Apple Watch Series 2, Apple changed the design of the Apple Watch Edition, switching to a ceramic casing instead of gold. The move from a gold Apple Watch priced from $10,000 to ceramic models starting from $1,249 is likely to have impacted the sales of the pop-up stores, as well as reduced the footfall from people wanting to try out the expensive hardware. Plans to close the Galeries Lafayette store have been known for some time, prompted by a decline in business, with employees at the location transitioned to other Apple Stores in the area. The closure brings the total number of Apple Stores in Paris down to three, in Carrousel du Louvre, Marché Saint-Germain, and Opéra. Earlier in January, the Selfridges Apple Watch store was removed from the UK retail listings, with phone calls to the branch advising customers of its closure, and to go to other nearby Apple retail locations instead. The Apple Watch store in Tokyo is still operational, but it is unclear if it will remain open or share the fate of the London and Paris galleries.